Web of Science: Is angelica a good medicinal herb. If so, how is it prepared? Is angelica a good medicinal herb. If so, how is it prepared? Angelica has proved to be one of the most important medicinal herbs throughout the duration of the settlement in Iceland. It was well-known among the early settlers. In adition to being an important food in Scandinavia and in the British Isles. 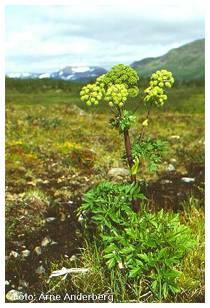 Its medicinal properties were well-known among the Nordic people. Angelica also grew further south in Europe, but the northern variety was thought to be more potent. When the Vikings started trading trips to Europe in the ninth century, angelica was an important commodity. In the autumn the roots were dried and used as a currency in trading. Icelandic written sources from the Middle Ages seldom mention plants used by men, but angelica does appear in a few places. In the laws of early Iceland (Grágás) there is a provision for the theft of angelica from someone else's patch, where the perpetrator could be outlawed or fined. The Latin name for angelica is Angelica archangelica. Legend has it that when smallpox was ravaging Europe in 1665, a monk dreamt that an angel showed him a plant, angelica, that could cure men of the illness. The monk named it Angelica archangelica after the angel and this name has been used since. Smallpox is an infectious disease that was usually fatal. Recent research has shown that there are compounds in angelica that can kill bacteria, so it could have helped. The whole plant was used, the roots, stems, leaves and seeds were dried. The beneficial effects were said mostly to be the warming and strengthening of the digestive organs, to enhance digestion, ease stress and loosen congestion. Angelica was said to be particularly beneficial for people recuperating after an illness, if they were weak and lacked stamina. Angelica was used for digestive disorders such as cramp and flatulence and for liver problems. It was considered particularly effective in loosening congestion in the respiratory organs and was used for bronchitis, pleurisy and other disorders of the lung. The seeds were said to be a good against cancer. The most common ways to use it were to make an infusion, or tea, or a tincture in 45% alcohol, of the leaves, root or seeds. The emphasis on the use of angelica fo digestive and respiratory disorders is understandable when one considers that living quarters were often damp and even cold, and food was often old, or even spoiled. Angelica is not only an ancient herbal remedy, it is also popular as a flavour additive. Angelica has been used as a flavour additive in the liquers Chartreuse and Benedictine and in the aperitifs, Vermouth and Dubonnet. Flavour from angelica has also been used in making gin and Rhine Muscatel, and last but not least in angelica root schnapps. Angelica is also used as a food, as a fresh herb on meat and fish. The American Food and Drug Administration (FDA) accepts angelica as "generally recognized as safe". Research at the Science Institute have shown that there are compounds in angelica that influence bacteria, viruses, fungi and even cancer cells, and there are compounds that seem to stimulate the immune system. These results confirm the empirical knowledge of past generations, that angelica can be used effectively for medicinal purposes. The effectiveness of Icelandic medicinal herbs has been compared with that of foreign products from similar plants grown further south. The Icelandic herbs have shown stronger effects than their foreign counterparts. This confirms the belief to this effect from the Viking Age. Sigmundur Guðbjarnason. „Is angelica a good medicinal herb. If so, how is it prepared?“. The Icelandic Web of Science 30.12.2005. http://why.is/svar.php?id=5529. (Skoðað 21.4.2019).